This naturally leads Anatolios to his first in-depth consideration of the theme of God’s relation to his creation in the work of Athanasius. The first section deals with the theme’s appearance in Athanasius’ Contra Gentes – De Incarnatione. Anatolios carefully distinguishes between Athanasius’ presentation of the relation of God to his creation (i. )before the fall and (ii. )throughout the course of history. Athanasius’ theology proper is expounded upon immediately after this, and followed by a discussion of the father’s cosmology, and his understanding of theological-anthropology. Anatolios’ account of the historical relationship between Athanasius’ philosophical and theological predecessors is helpful in two key ways. Firstly, it allows us to better understand Athanasius’ language, as it is embedded within a very specific historical context and, therefore, derives its signification from that time period. We can, thus, read him and better comprehend his arguments, which shine all the more brightly when set against the dark backdrop of the blind speculations of the philosophers, and the errors of Origen. Secondly, we can dispel recurrent accusations of restorationists and unbelievers who claim that the doctrines of the Trinity, the immortality of the soul, hell as eternal conscious torment, and so on are derived from Greek philosophy. Following Irenaeus, Athanasius maintains a strict Creator/creature distinction, all the while stressing that God and his creation are now, and will always be, dialectically interacting. 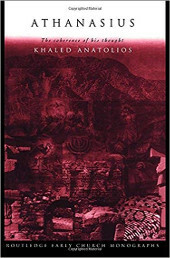 It is this consistency that Anatolios proceeds to demonstrate in the following chapters which respectively deal with the relation between God and creation in the anti-Arian writings and the relation of God and creation in the context of grace. Athanasius further argues against the Arians by demonstrating their doctrine leads to an infinite regress as regards the relation between God and his creation. The Arians sought to identify Christ as mediator between God and the world, but their denial of Christ’s equality to the Father made this impossible. Adam received grace externally from the Logos, but this is surpassed in the incarnation by our internal reception of grace from the Son of God’s union with humanity. Anatolios' work is an important contribution to the study of the fathers, especially given our present time. If you are looking for a definitive text on the theology of Athanasius, Athanasius: The Coherence of His Thought is it. 1 In the case of Athanasius, whom the annihilationists falsely claim as their own, see Diaz, Hiram R. Athanasius, Ontology, and the Work of Christ (Lewiston: Scripturalist Publications, 2018).